At what age should my child get braces if their teeth are crooked? When should I take my son to the orthodontist for the first time? What is the best age for my child to see the orthodontist? Is there a “right” age when an orthodontist should start fixing my daughter’s crooked teeth? How long should I wait to take my son to the orthodontist for braces? At Jordan Orthodontics in Alpharetta, GA, we care about your son or daughter as if they were our own. We want what is best for him or her, especially when it comes to great dental health and a beautiful smile. So that’s why we wrote this article—to answer some of the most common questions regarding your child’s first orthodontist appointment. When is the best age for a child to get braces for crooked teeth? What age do orthodontists recommend? Put simply, a “right” or a “best” age doesn’t exist for a child’s first trip to the orthodontist office. Rather, keep an eye on your child’s teeth and bite alignment. Keep an eye on changes that you may see over time, but don’t wait too long if you suspect that something just isn’t right. Call the orthodontist for an appointment. If your young daughter or son has misalignment issues or crooked teeth, he or she can most likely benefit from braces (metal braces, Invisalign® Teen clear braces, etc). An orthodontist will be able to determine which type of braces are best for your child’s specific needs. All in all, there isn’t a definitive answer regarding age. However, many orthodontists (and Dr. Jordan) recommend taking your child to his or her first orthodontic appointment around the age of 7 OR at the first sign of orthodontic problems. Remember when we just told you about keeping an eye on your child’s teeth and bite alignment? Do that. If you see crowding issues, bite alignment issues, crooked teeth, overbite, underbite, or protruding teeth, schedule your child’s initial orthodontic evaluation as soon as possible. Keep in mind that every child is different though. Every child’s mouth doesn’t develop the same way. However, around the age of 7, common orthodontic issues (i.e. uneven bite, overcrowding, etc) become visible. Just remember — keep an eye out for potential oral problems and call your pediatric dentist or orthodontist depending on the type of dental problem your child is experiencing. Your child’s first orthodontic appointment is an important one. He or she will get to know the orthodontist and other team members. The introductions should go smoothly and your child should feel comfortable asking questions. He or she shouldn’t feel afraid or scared, but if this happens, the orthodontist should be trained and experienced to effectively handle the child’s emotions. The first appointment probably won’t last too long, but you and your child will receive a lot of great information, as well as sharing health-related information with the doctor. The orthodontist will need to know your child’s health history by completing the new patient paperwork. The orthodontist will perform an evaluation of your child’s mouth— the teeth, gums, the bite, the jaw, etc. X-rays and/or impressions may also be taken. He or she will make notes in your child’s chart as to the extent of orthodontic issues. These notes will be used to develop a treatment plan to straighten your child’s teeth (source: http://kidshealth.org/en/parents/braces.html). The orthodontist will look for signs of decay and other dental issues. If there are dental issues that your child’s pediatric dentist should fix prior to orthodontic treatment, that will be discussed with the parents. You and your child should feel comfortable asking questions during this first appointment. If you or your child doesn’t feel comfortable, maybe the orthodontist isn’t the right one for your family. Just so you understand a bit more clearly, this first appointment kind of sets the tone for the rest of the appointments. That’s why it’s very important that your child feels comfortable and at ease right from the start. This will help to develop a healthy foundation for all future orthodontic appointments. And now we invite you to learn even more about your child’s first orthodontic office visit at Jordan Orthodontics. Dr. Jordan is confident that you and your children will feel comfortable and happy that you chose us! Looking for an orthodontist in Alpharetta, GA? Jordan Orthodontics is here for you. 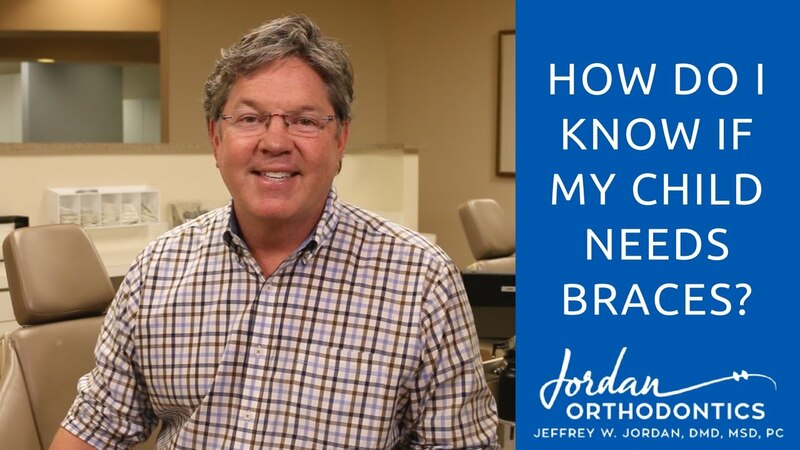 Whether your child has to see the orthodontist for the very first time or if you’ve gone to other orthodontists, but your child didn’t feel comfortable, just call Jordan Orthodontics to become a new patient. The goal at Jordan Orthodontics is for our caring, gentle team to make your child feel at home. Furthermore, Dr. Jeffrey Jordan, has been practicing for 25 years and has treated more than 10,000 patients — 75 percent of which have been children or teens. You and your child can find comfort in those statistics! We are just one phone call away from your child having a wonderful orthodontic experience. We love helping kids feel comfortable and fixing their crooked teeth in the most gentle way possible. We look forward to meeting your family’s orthodontic needs.